Amal Clooney is pregnant, possibly, or just ate a burrito? Stop everything: According to , Amal Clooney—human rights lawyer, wife of George Clooney, and stunningly gorgeous human—is pregnant. Of course, take it all with a grain of salt because the Clooneys have yet to make any official announcement. Alas, it is being reported that a source close to the couple told In Touch that Amal is pregnant with twins, a boy and a girl. Congrats to those fetuses for having hot parents. "When George and Amal found out it was twins they were surprised, but also a little scared because they both had said that one was enough. But the news that it was a boy and a girl made them both really happy. They feel like they’ve hit the family jackpot," claims the unidentified source. The source added, "They’re having so much fun looking at all the latest baby gadgets and getting everything ready for the twins. They’re going to be such amazing parents." Rumors were only perpetuated when Amal Clooney—gasp!—dared step out in a semi-loose fitting outfit while visiting Davos, Switzerland this week. Can't a girl be comfy without people thinking she's pregnant? 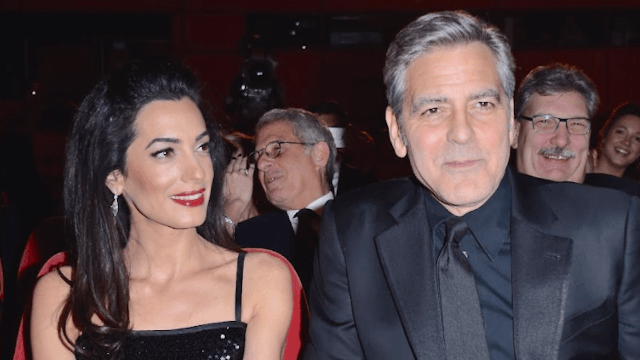 In Touch claims that Amal Clooney has had to overcome her fear of needles for IVF treatments she has been enduring since the summer in order to conceive. This is all especially surprising since her hubs has been pretty outspoken about not really wanting kids. The Daily Mail got even more specific with their reporting on Amal Clooney's alleged pregnancy, saying that the two want to name their son "Nicholas" but have not revealed a choice for girl's name (well, they have not revealed the pregnancy either, so...). The Mail also claim that the couple has already begun outfitting their $15 million dollar home in Sonning, Berkshire with an entire "baby wing," complete with "baby spa," library and "mini baby pool." I have no idea what half those things actually are. The very private 38-year-old lawyer and 55-year-old actor wed in 2014 and have made no public announcements about a plans to start a family. We are skeptical, but 2017 could be the year we see these two very good looking humans make two very good-looking babies! Just make sure you get a gate for that "mini baby pool."